NOTE: It’s important to remember that every person’s preference, likes, and dislikes will vary depending on the work they do with markers. My needs and expectations may vary from yours. Please do not mistake my preference as being the one and only way. This blog post is only meant to be an elaborate explanation of my personal preference and identify the quirks I have noticed when experimenting over the past few years. I have experimented with double-ended alcohol-based markers over the past two years or so and learned quickly in that time that I prefer Prismacolor brand markers. There are significant and subtle differences between two major brands like Copic and Prismacolor. I tend to do larger pieces with plenty of tiny details as well as large-fill areas. The fine nibs on the Prismacolor double-ended Chisel/Fine tip Markers are great for the details and the larger areas fill well with the sturdy chisel nib. I’m not as much of a fan of the brush-style tip from the Prismacolor double-ended Brush/Fine tip Markers, which helps me since the markers with the brush tip are a little pricier than the ones with the fine nib and chisel nib. Copics have quirks to them that make Prismacolors my fav despite not being able to refill the ink or change the nibs. I recommend that for those just starting out with markers test a few markers from both brands (and/or any cheaper lesser known brands) to find what YOU like most. Prismacolors are at the lower price point in the main duo of marker brands and tend to be available online and in some art stores, which is why it’s a little cheaper and easier to experiment with them while also guaranteeing quality materials. However if you’re willing to either take the time to read reviews or are ready to risk spending a little less money for an unknown or little-known product, you may find an acceptable brand through Amazon or Ebay. I, however, started with a 24pc set that my mom bought for me over 15 years ago (yep, they lasted that long, in storage, and after using them on Fuzzy posters lol! Admittedly the fine tips were dried out but they were a different style than they currently offer; more like a micron pen tip than a marker tip.) Once I got the hang of them, I loved them. So much in fact, I splurged on a 200pc set. It took me a few months to work up the courage (and funds) for the set. Thankfully some art stores allow you to buy individual markers. And when it is time to upgrade/expand, the sets are reasonable on Amazon! CRAZDUDE PRO TIP: I heard from a student of mine who bought a single Copic marker only to have it dry out quickly after they purchased it. If you buy single markers — ones that are available for shoppers to test and draw with in the store before purchasing — try to find the heaviest marker from the color you want. Ensure that it makes juicy marks on paper when you test both marker nibs. I have also come to learn the old Prismacolor labeling versus the newer labeling and usually try to get the newer labeled markers whenever possible just in case the older ones have been kicking around the store for a while, getting used by indecisive shoppers. I find that Prismacolor has a more consistent flow of ink over a longer period of time. Prismacolor doesn’t leak nor do they go from dramatically juicy to nearly dry with light use, as my Copics have.) Also some brands/varieties of papers don’t play well with Copics and you get a weird texture effect in the color. O’ dear, I do believe my print geek is showing *blushes*… Okay, that’s enough nerdy rambling about paper from me. You can learn more about optical brighteners and paper making… if’n you wanna. CRAZDUDE PRO TIP: For both brands, blending is a breeze if you use multiple colors rather than colorless blender. A colorless blender can help blur streaky areas of light color together or lighten dark areas almost like erasing the color. I personally prefer to blend color to color with layers and wispy strokes. Blending is much easier and smoother in appearance when the inks are still fresh and wet on the paper. Work fast! You’re racing against the alcohol vanishing into thin air and leaving you with colored, dry paper. Speaking of paper, I find that Bristol paper works really nicely. Smooth surface, thick paper, dense fibers. Only slight bleed through the paper (not enough to stain a table unless you’re really aggressive) but doesn’t spread too much across the paper (bleeding stays within my illustration inks for the most part.) When I first bought paper for my marker experimentation, I bought “marker paper”. It was not what I expected. It was like tissue paper, very thin and the ink of the markers bled a LOT (both through and across the paper.) Thank heavens I have a friend who gladly adopted the pad of paper; she uses it for tracing sketches (I personally hated how my sketching looked on that paper too! Ugh!) This is one great example of why experimentation is optimal before you go too crazy stocking up on supplies and why preference does not mean one way is right and every other way is wrong! One thing that has been a sad discovery for my fellow Prismacolor users and myself: yellows and oranges in laminated Prismacolor badges tend to bleed over time. This doesn’t seem to be an issue with Copic nor is it an issue with Prismacolor artwork that isn’t laminated. Additionally, Prismacolor has stated that their marker inks are not archival. So when exposed to the air or direct UV/sunlight, the inks fade with time. I have had an illustration in a frame that has faded by about 20-30%. Meanwhile a similar illustration (same paper and marker brand) kept in a protective sealing plastic sleeve in a portfolio has retained the vibrancy as if I just colored it yesterday! CRAZDUDE PRO TIP: Keep marker artwork out of the sun! Additionally, keep it sealed or protected from exposure to the air. For badges, create copies of Prismacolor or Copic artwork so that you can laminate or frame the copy and protect the original. When comparing the nibs on Prismacolor versus Copic, I prefer the fine nib on the Prismacolor Premier Double-ended marker vs any brush tip (regardless of brand) due to consistency, precision, and ability to keep ink in the nib over time. I have also noticed that the Prismacolor chisel tip holds up better over time physically than the Copic chisel. I have noticed that with similar use, the Copic chisel nibs fray/soften faster than Prismacolor chisel nibs. Copic brand’s nibs can be replaced but when I’m relatively aggressive with my coloring, I prefer the heartier chisel of the Prismacolor brand marker which appears to be a different construction that lasts far longer and resists fraying. Another downfall to Copics is accessibility. Copics are so popular and well-known that coloring book colorers also use them; Copic hasn’t been able to keep up with demand which makes them hard to get, you have to wait an extended period of time for them to ship, and can be more pricy than usual. They are also harder to find in local art stores and when you find them, there isn’t much of a selection. Some suggested online shops for various marker brands include: eBay, Otakufuel, Blick Art materials, Jerry’s Artarama, and Amazon. I have also noticed the selection of greys in the Prismacolor set are astoundingly diverse; French, warm, cool, and neutral. Seems excessive but when you want a particular aesthetic and the subtlety matters, Prismacolor has your back! Additionally, the Copic’s warm grey looks more brown-grey (or closer to a taupe than a grey) which is unacceptable for my purposes since I use the Prismacolor warm grey 50% and 70% for Craz-wolf who is most definitely grey wolf, not a taupe wolf! Greys aside, the selection of tans, umbers, beige, buff, blonde, and other pale colors are nuanced enough that I haven’t needed to search anywhere else to supply the color palette offered by Prismacolor. There is always a want for more purples and blues in my opinion but again, I feel that Prismacolor has an impressive selection of tones and hues that I can work with the colors I have to blend and create new variations when a slight variation is needed. They offer purples that run pale or dark. Purples that are reddish, pinkish, blueish, grey or hazy. Blues from the palest Sky Blue Light to the richest Ultramarine to Navy and everything in between. When color matching, I do believe that popular options can be advantageous. When referencing the colors of a Copic set or Prismacolor set, it’s like speaking a universal or at least common language. If you are trying to match the colors of the Touch Five Markers or other less-popular brand, artists may have trouble matching your colors, and you may struggle matching anyone else’s colors. For someone who is as neurotic and precise about color matching, I prefer to have a set that is expansive (pale to rich, vibrant to dull) and has distinctly different hues across the whole set as is found with Prismacolor. And if you REALLY want to get picky, Prismacolor has a Color picker that can help you convert colors from a digital ref sheet to find which markers you will need! Always be sure to store these double-ended markers on their sides too. The ink will dry up on one end if you keep them standing up on their ends; this goes for any double-sided markers. I have used various methods to store them. One of my first storage methods was to use a sock drawer organizer I got from Bed Bath and Beyond, place it on a table so that the markers lay on their sides with the back-ends of the markers butted up against the wall, all in groups of the same color inside the different compartments; all the reds, all the oranges, all the yellows, etc. More recently, I have been using a small multi-bin storage container/shelf (above Left) that I purchased for about $15 at a hardware store. 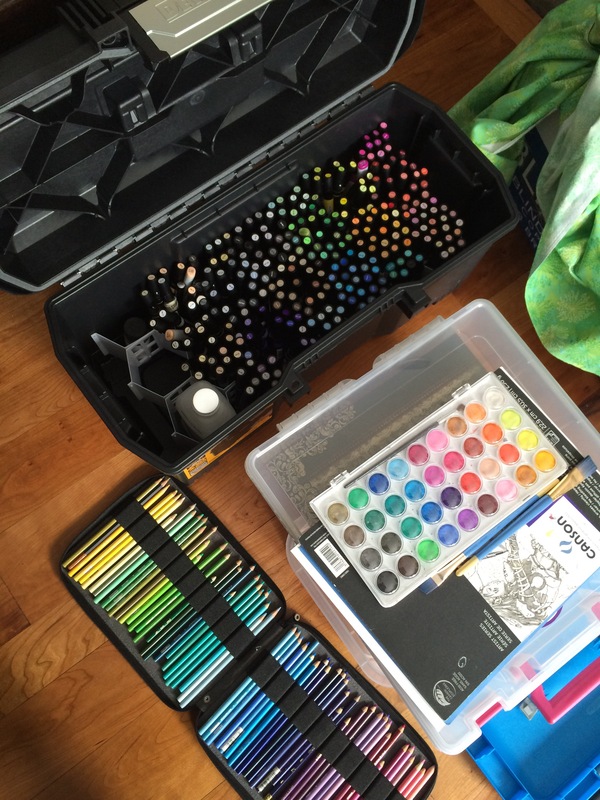 I took most of the drawers out and used the empty drawer compartments to store my markers. The bottom drawer contains my finishing tools. For convention travel purposes, I keep them in the sock drawer organizer but vertically set in a tool box (above Right.) And just for a weekend for easy access and sorting; far better than dumping them loose into a bin for me to aimlessly dig around in. Once I’m home, I try to get them back on their sides ASAP. Also I don’t like to test the temperature tolerance of my markers. I try not to leave them in a hot car or out in the freezing cold. I’m not sure if the cold would affect them as much as a hot day but, again, I’d rather not risk it with over 200 markers at $3-6 each! So with all this said, go experiment! Find what you want to accomplish with your art by trying new methods and materials, seeing what you like and what you don’t like. Try at least 4 different papers, try a handful of different brands and colors of markers before you commit to a particular brand and buy that marker set of your dreams! But most of all, treat these markers with respect and care, that way you will have them for years to come. Even if they don’t work for you now, you may pick them up in 15 years and finally figure them out like I did! First time user here. I decided to try these pens today. I bought two. You laugh,but I didn’t want a bunch of pens I didn’t like. The first pen was double ended, one end fine and the other end thick. It worked great. The other one was double ended also. One end med nub and a brush at the other end. This one is brick white but there is no color, only solvent . I have tried using it on scrap paper to get the paint to the tip, I have tried shaking the pen to “ mix” it together but nothing seems to work. Neither end. What am I doing wrong or is it the pen? For Prismacolor markers, I’ve only known them to be double-ended (fine end being standard, the dominant end varying between brush or chisel: brush-style are generally a little more expensive than the chisel-style.) Sounds like you got one of each! And this way you can see if the brush is worth the investment in future purchases! As for your the issue you’re facing with the Brick White, from what it sounds like, you’ve tested to see that there is fluid in the marker so I know it’s not a dry/empty issue. But I will say that Brick White is very faint; sort of a mild grey tinting effect. Barely any more color than a colorless blender! If you test on white paper, you should see that it lightly “dirties” the paper when the solvent dries. It’s ideal for very fine shading on very bright white objects and surfaces. It will be more noticeable if you draw with it, let it dry, then draw over it again. Let me know if you see the faint color!